Wanting to stock up on foods with minimal cost? Here are the ins and outs on why and how we have built a stockpile without coupons! 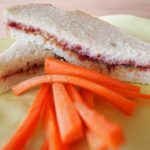 This is the last post in the Meal Planning Series. 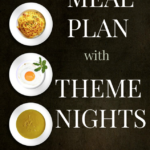 We have discussed the importance of having a meal plan and how theme nights can help you create that meal plan. We talked about making sure it is affordable for your family and I showed you what our current menu looks like! Today will finish by building on last week where I discussed the need for a rotating grocery list. This last and final topic stresses the importance of having a 6 month supply to further simplify your meal times. 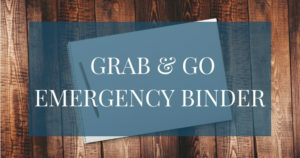 The first thing that might come to your mind when I talk about having a six month food supply is Emergency Preparedness. This isn’t necessarily the bug-out bag type of Emergency Preparedness that I want to talk about. We do have 72 Hour Kits for my husband and I, a 72 Hour Kit for each of our kids, and emergency food. What I want to talk about today is more the mental emergency that happens around 5:00 when your kids are all begging to know what’s for dinner! First off, why would you want a stockpile? I worked as a checker in a grocery store as a teenager. Because of that experience I got really good at memorizing the prices of things. It was so hard for me when I went off to college and had to pay full price for something knowing that in just a few short months it would be on sale for a fraction of what I was paying then. 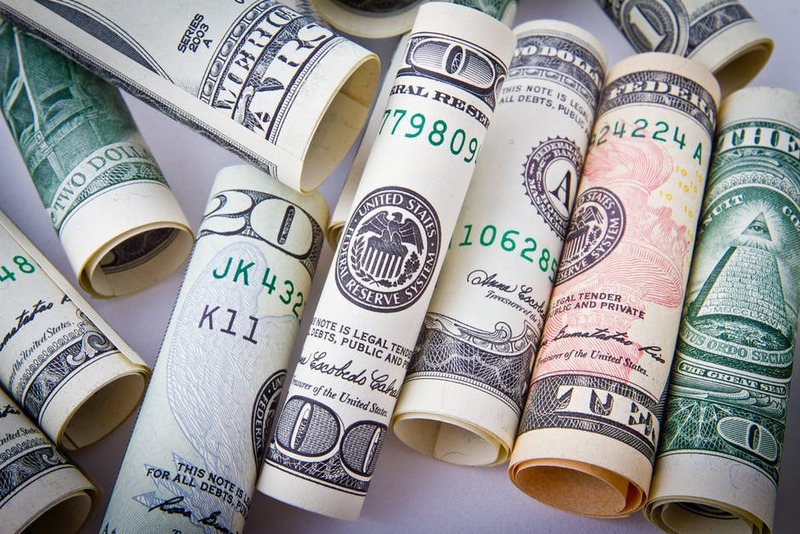 Stocking up on items when they are on sale will save you tons of money in the long run! Another reason to have a stockpile is that when you run out of something, you aren’t actually out. You use up the last of the toothpaste, go grab a new one out of your storage. Need spaghetti sauce for a last minute quick meal? Go to your spaghetti sauce spot in your pantry. Building a stockpile does take awhile because you still have to eat while you wait for things to go on sale. The long-term benefits far out weigh the cost though. Just be wise and start small, but start today! If you want to start a stockpile, plan your meals around the sales rather than around what you feel like eating. The grocery store ads will post the “loss leaders” on the front and back pages of their ads. These are items that are extremely marked down to entice customers to shop there, knowing the customer will buy more than just the advertised items. The ads usually follow a theme: baking goods, Mexican foods, pasta and sauces, breakfast foods, etc. There will be other deals i the store, but the loss leaders are the very best deals. When you are buying something on sale, rather than just buying one for your meal planning, buy two or three. 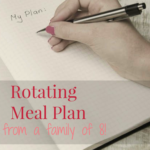 It’s more money up front, but will save you money if you create a rotating meal plan. 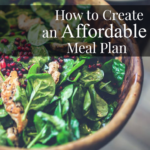 When you need that same ingredient for the same meal next month, you will already have it on hand rather than having to run out and buy it at full price! Buying extra works for all pantry and freezer goods. 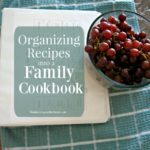 Make sure that you have an organized system to rotating everything so you use up the oldest food first. You don’t want tot be buying food that you are just going to let go to waste in your cupboard! Along these same lines, I don’t stockpile specialty ingredients. If it’s not something that I use on a regular basis, I just don’t buy it unless it’s on sale and I will buy enough to make that one meal. I buy all of my canned veggies and beans twice a year for the case lot sales. Salsas are purchased for the year in May for Cinco de Mayo. I stock up on all pasta and sauces for the year when the store has their Italian week. Chocolate chips and butter are the cheapest around Christmas and Thanksgiving. Hams and Turkey are purchased at Thanksgiving and Easter and kept in the freezer throughout the year. Having these items bought at the lowest price and then stored, rotated and used until they go on sale again at bottom dollar saves so much money! Getting familiar with your grocery store of preferences and their ad cycles will help you better come up with what to buy and when. 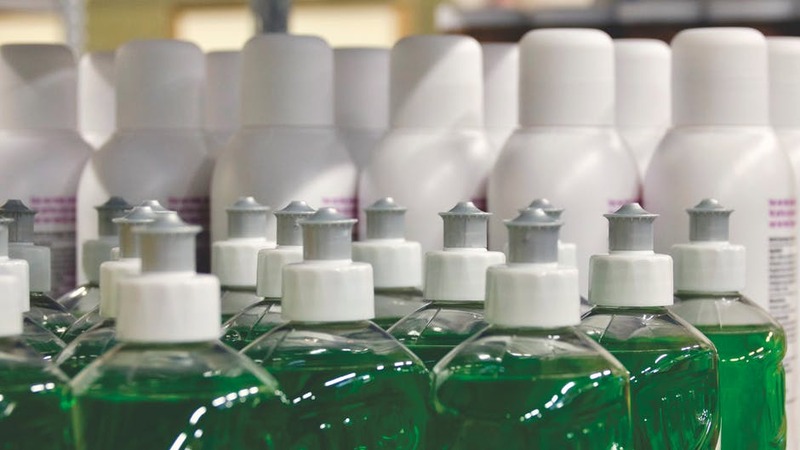 All our toiletries are bought in the same manner as our food. I know that you can get great deals on these things with coupons. I used to shop at Walgreens and get free stuff all the time. For this phase of life though, it is easiest for me to go to one store since I always have a group of littles with me. Again, familiarize yourself with prices. This can be a little bit trickier because grocery stores don’t advertise toiletries the same as food products. When your favorite toothpaste goes on sale, buy two instead of just one so you always have an extra on hand while you wait for the sale to come around again. 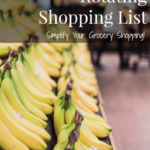 For things on our Rotating Menu, it is easy to just look at my Rotating Shopping List and buy six times the amount of each item to get a six month supply. With toiletries however, things tend to vary. We wash hair more in the summer with kids going to the pool, so we need more shampoo. We have a new independent tooth brusher so we have to expect that nearly half of each tube will end up on the counter, floor, or sink. To keep track of how long it takes us to go through these items, I just write the date the product was opened on the container. When we throw the empty container away, I know how many I need to buy to build a six month supply. Again, you want to make sure you are only buying what you will use before the expiration date so you aren’t wasting your hard earned cash. 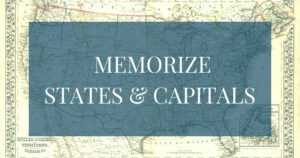 You will want to make sure to budget for buying higher quantities or bulk-sized packages. It may seem like you are spending more money, but those larger purchases will last you much longer than buying one or two smaller packages. Honestly, this is the part where you might have to get creative. As much as I would love a Pinterest kitchen where everything has it’s spot, that is just not realistic. 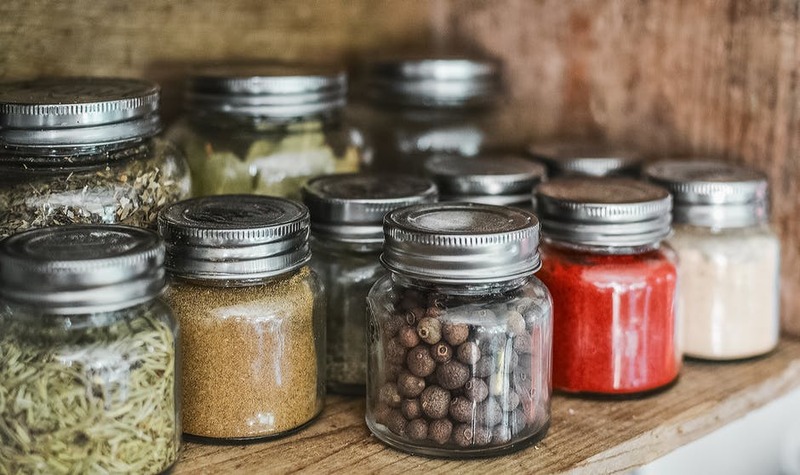 Depending on the time of the year, cold cereal or canned good could be taking up every blank space in my pantry. We have general areas where things belong, but the actual amount of food fluctuates quite a bit. We don’t have any cold storage or designated food storage in our house beyond our pantry, so we just have to improvise. We took out the ice maker of our side by side refrigerator freezer to have more room to store food. We also have a separate chest freezer which is regularly rotated and constantly kept full. Our pantry is stuffed to the max with food items as well as our off-season cooking items for canning and processing food. Food items that are stored in buckets are kept either behind the couch or used as step-stools for the kids throughout the house. Our kids don’t have much room to hoard things under their beds. This is where we keep our emergency water supply as well as extra toilet paper. Because we are trying to have a more minimalist approach, toiletries all easily fit under the sink and in bathroom cupboards. So there you have it! 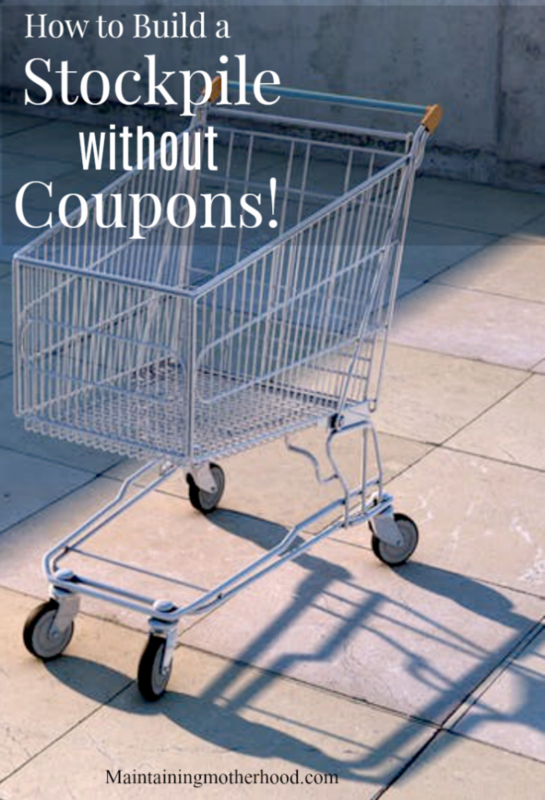 Some quick tips to starting your own stockpile without clipping a single coupon! 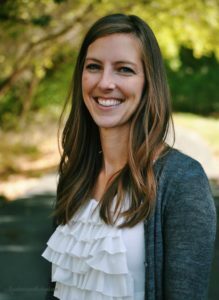 Tell me about your long-term food storage!